After years of wastefully using fried chicken as nothing more than the occasional sandwich garnish or, in a pinch, as a standalone entrée, man has slowly begun to realize fried chicken’s full, utilitarian potential, as a substitute for things that are not fried chicken. In 2009, KFC boldly forged this new era in applied fried chicken sciences with the Double Down, which finally replaced the space in your fried chicken sandwich previously occupied by trace amounts of filler grains with more fried chicken. Now, five years later, that march of progress continues, in much the same manner that silicon chips replaced vacuum tubes in computers, and that silicon chips will soon be replaced by fried chicken. Forever at the vanguard of putting fried chicken where fried chicken wasn’t before, KFC recently introduced the Drumstick Corsage—a limited-edition, custom-made corsage made of the finest baby’s breath, and the most easily graspable drumstick from your local KFC. 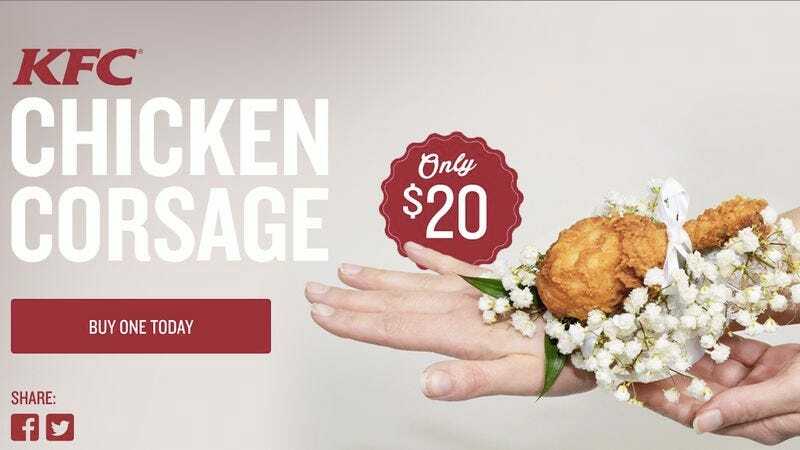 For just $20, you can order your prom date the only bouquet at the dance that smells of the future, as well as of the fried chicken you pick up with an accompanying $5 card—in Original Recipe, Extra Crispy, or Kentucky Grilled (for cautious luddites). The ad promises the KFC Drumstick Corsage will make your night “one you both remember,” replacing the forgettable exchange of old-fashioned romantic gestures with the progressive, indelible stains of fried chicken. By contrast, when it comes to the advancement of foodstuffs onto other foodstuffs, Domino’s Pizza has often lagged behind its contemporaries. Even by its own admission, the Oreo Cookie Pizza was a failed experiment, and it’s since stood by fecklessly as Pizza Hut developed pizzas with hot dogs and miniature cheeseburgers in the crust—like the Vostok to Apollo, if Apollo had been filled with hot dogs instead of people. But now it’s determined to change, having at long last acquired the technology to replace the crust in its pizza with fried chicken. As seen in the ad below, Domino’s has introduced the Specialty Chicken, so named for the very specialized process of putting things on fried chicken, then melting cheese on top of them. Among them are the ingredients included in the four introductory flavors—Crispy Bacon & Tomato, Spicy Jalapeno-Pineapple, Sweet BBQ Bacon, and Classic Hot Buffalo—all of which are piled atop Domino’s boneless, breaded chicken breasts, then smothered in sauce and cheese. “If we gave up after every mistake, we wouldn’t come up with something new like our Specialty Chicken,” says Tate Dillow, “Domino’s chicken chef,” of the food that is definitely not for people who have just given up. As noted in the press release, Specialty Chicken is the first new product for Domino’s since the launch of its Handmade Pan Pizza in 2012—a Domino’s pizza that was, for the first time, made with human hands. At the current exponential rate, it’s hoped that hands could be replaced by fried chicken as early as 2017.